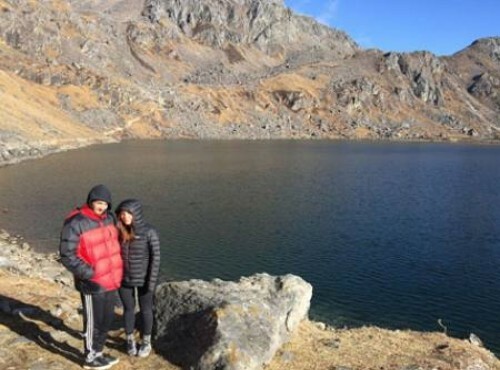 Langtang Valley with Ganjala passes trek is both one of the most physically challenging and also one of the most rewarding and spectacular of all the treks we offer. Among the highlights are contacted with diverse ethnic groups (especially Tamang) inhabiting the villages through which we pass, and the breathtaking Himalayan scenery surrounding us, especially as we cross the high pass called Ganja-La. We never retrace our steps, nor do we need to fly either to reach the trailhead or to return to Kathmandu. If you have a very good fitness level, a strong sense of adventure, and preferably some previous Mountaineering experience, this trek will make an excellent choice. After arriving in Kathmandu, you will have some time to sight-see but will also participate in trek preparation, in which we review equipment and clothing needed for a safe and enjoyable adventure.You can expect wind, cold and snow near Ganja-La, so it is essential that we prepare well for this part of the trek in particular.We then drive to Syabrubesi, and from there trek to Kyangjin Gompa via Lama Hotel and Langtang Village.We will spend two nights at Kyangjin Gompa both to promote acclimatization, and to explore some interesting sights in the vicinity. We then head south from Kyangjin Gompa to Ngegang -- a short hike, but an important one as it's the closest place to Ganja-La where we can spend the night.We rise early the next morning, crossing the thrilling Ganja-La, Which may be very cold and snowy.The Himalayan vistas surrounding us in the vicinity of the pass are fantastic. Continuing south, our route brings us to Keldang.Soon we descend into the Helambu Region, overnighting at Dukpu before reaching the fascinating town of Tarke Ghyang.Many of the old houses in the narrow lanes of this Yolmo village go back to the 18th Century, and in the very center of the town you will find the oldest monastery in the Helambu. After leaving Tarke Ghyang, we trek via Sermathang to Malemchi Pul Bazaar and drive from there back to Kathmandu for a farewell dinner, and our homeward flight the next day. Day 04: Trek Syabrubesi to Lama Hotel. Day 06: Trek Langtang village to Kyangjin Gompa. Day 07: Visit Tserko RI (5,033m/16,404ft) and back to Kyangjin. Day 08: Trek Kyangjin to Ganja La Phedi. Day 09: Cross Ganja La pass (5,122m/16,800 ft.) to Keldang. Day 10: Trek Keldang to Yak Kharka. Day 11: Trek Yak Kharka to Tarke Gyang. Day 12: Trek Tarke Gyang to Sermathang. The exciting day begins with a cultural tour to various medieval sites in Kathmandu. You will drive to visit the UNESCO listed world heritage sites - Pashupatinath Temple (the biggest Hindu shrine), Boudhanath (largest Buddhist Stupa in Nepal), Swayambhunath (a beautiful Buddhist stupa at the hill top of Kathmandu) and the Kathmandu Durbar Square (an open museum and abode of Kumari). Coming back from the sightseeing, you will take part in a short briefing and trip preparation. Overnight at hotel. Early in the morning, we drive from Kathmandu to Syabru Besi enjoying the scenic views of the ridgeline and terraced farmlands. The stunning scenery of Ganesh Himal can be explored. The pleasant drive then goes through the bumpy road, continually to Syabrubesi via Dhunche. Overnight at Teahouse. Following the Langtang Khola, we head from Syabrubesi to Lama Hotel. During the foothill excursion, we walk through the rugged path and rhododendron forest of the Langtang National Park. This is a pocket zone of the red panda. Via Bamboo, we reach Lama Hotel. Overnight at Teahouse. We reach to the Langtang valley today via Ghoda Tabela. It is a gradual climb up viewing the beautiful sceneries of the green hills and picturesque Tamang villages. Langtang village is a unique and typical Tamang village, which is renowned for preserving the traditional values and cultural perfection. Overnight at Teahouse. We have a short walking today, which is nice for acclimatization. On the way, we pass some of the beautiful tiny ethnic settlements, cheese factory, and cultural diversity. Kyanjin Gompa lies below the Langtang Lirung. The Gompa is a renowned one in Langtang, which reveals the spiritual perfection of the villagers. Overnight at Teahouse. Today, we spend an exploration day, and we hike to the Tserko Ri. We walk up to the moraine after breakfast, explore the Himalayan wonders. Mt. Langtang Lirung and other Langtang region peaks can be explored during the hike. Even we can experience the cultural prosperity of the ethnic Tamang inhabitations. Overnight at Teahouse. From Kyanjin, we climb up to the Ganja La Phedi, which is no man land. But there are little vegetations. We reach there and take a rest. As the height crosses 4300 meters, we need good physical fitness and acclimatization. Overnight at tented camp. It is a tough day among the entire trekking days. We begin the trek quite early and cross over the Ganjala Pass (5200m). It remains snow covered for half of the year. Descending from the pass, we trek further to Keldang and take a rest. Overnight at tented camp. From Keldang, we trek down a long way through the grassy land prevailed all the ridgeline of the hill. If you talk about the mountain views, we can enjoy Langtang region peaks and Tibetan peaks. Descending to Yak Kharka, we find the suitable place for camping and take a rest. Overnight at Teahouse. After breakfast, we trek down gradually and again climb up to cross over the pass of 4100 meters. It is pretty much challenging. The stunning view of the Everest range can be seen from there. Then we trek down through the rhododendron and pine forest. We reach to Tarkeghyang, which is a tiny herder settlement. There is also a Buddhist monastery. Overnight at Teahouse. The trail from Tarke Ghyang to Sermathang is relatively easy. The trail is flat, and even the route through the forest is gentle. Semarang is a Sherpa village where we can explore the beautiful monastery with the beautiful Jugal Himal in the north face of the village. Overnight at Teahouse. The last day of the trek, we trek down from Sermathang to Melamchi Pul Bazaar. Sometimes we walk through the meadows and forest and also through the farming land. We pass several ethnic villages that are ancient and unique. Then we walk through the bumpy and graveled path up to Lamidanda and through the fine trail to Melamchi Pul bazaar. Then we drive further to Kathmandu. We enjoy the farewell dinner in a typical Nepali restaurant hosted by Adventure Club. Overnight at hotel. Kathmandu valley sightseeing tours including tour guide and entry fee.